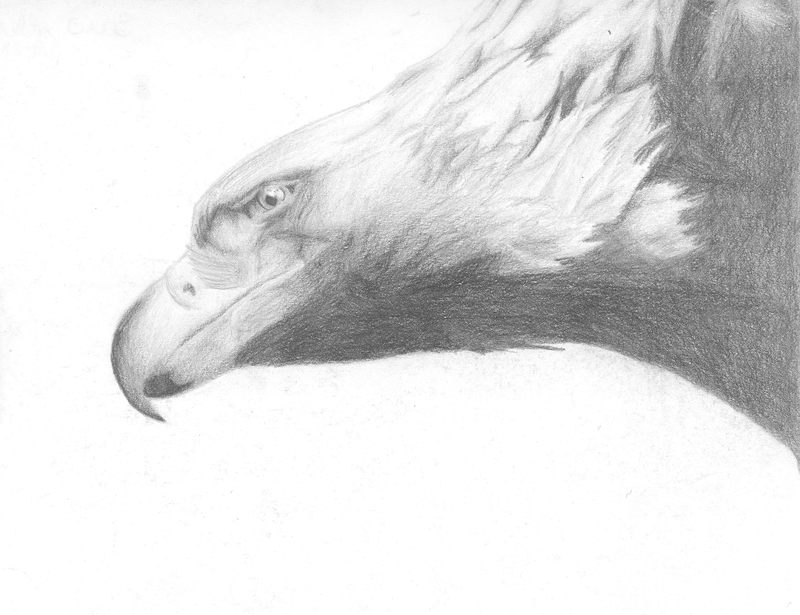 Back When I Could Draw…. Once upon a time, around 1999-2003 or so, I used to be able to draw. I’m out of the habit now, although I still occasionally do an art project. But I’m scanning in some of my old drawings so I’ll have digital copies of them, which is a bit of a trip down memory lane. 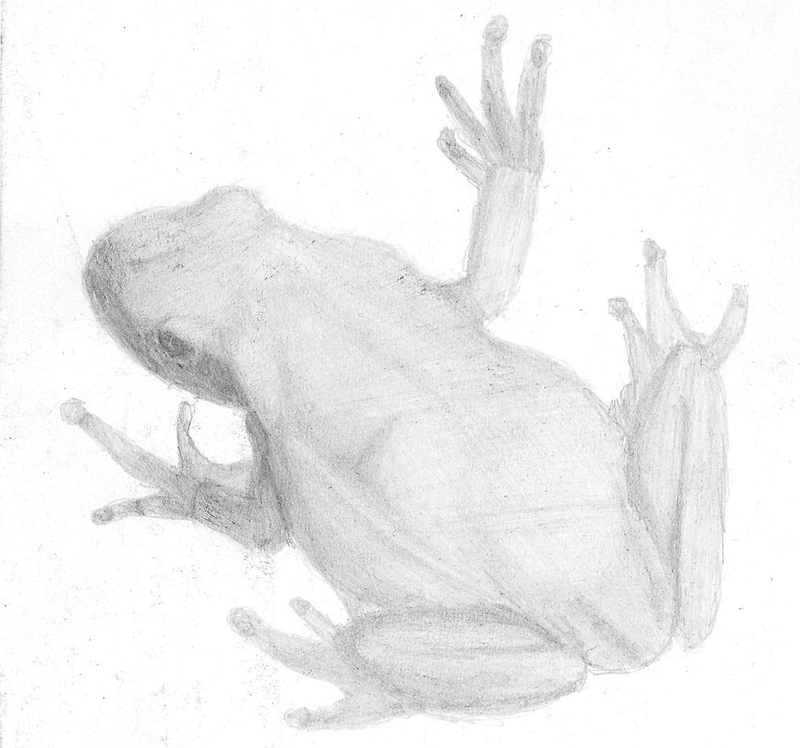 The two drawings included in this post were done toward the beginning (the tree frog) and end (the hawk) of my first semester of art class at Corydon High School, back in 1999. I have many good memories of learning to shade without scribbling in that class, most of them with a soundtrack of Big Bad Voodoo Daddy and the Squirrel Nut Zippers, with many good conversations with my friends and with our awesome art teacher. First, you sketch the outline. The outline is rough, vague, and leaves out the details and the shapes the shading is going to fill in. Then you write your rough draft, which is like the first pass at shading a drawing – get your contrast set up where you need it by filling in your darkest darks and marking off where your lightest lights will be, making sure all your proportions (pacing) are right. The second draft is blending – smooth it out, shade in your grey areas, and get rid of the pencil marks left over from your sketch. And in your third draft, you perfect your details, clean up, and bring out anything that needs sharper focus or more definition. So that is how my art teacher from 16 years ago taught me both how to draw and how to write novels. Further proof, as if we needed it, that one kind of creativity informs another. On the subject of the middles of stories and novels, the foremost topic that comes to my mind is pacing. The road of pacing is fraught with many perils, traps, meanderings, and pitfalls. It’s one of the single hardest things to fix about any given part of a story, if it goes wrong to begin with. Pacing, like most things, is a continuum with two extremes at either end. Slow pacing is boring because the story drags out longer than necessary to get to any satisfying point(s) in the storyline. Fast pacing is also boring, because too much is going on to take any satisfaction in the events of the storyline. What’s the key in both cases? A sense of satisfaction. Before you can be satisfied with something, you have to start out by having a desire – take eating, for instance. If you’re hungry, you eat something, and you feel satisfied if the meal is good. If you’re not hungry, maybe you still have a craving for a certain food, and if you eat that certain food, your craving is satisfied. If you’re not hungry and you don’t have any desire for a specific favorite taste, then eating is anything but satisfying – even if you eat compulsively, the whole point is that you are never satisfied. So you have to make the reader want something from your story, to begin with. That’s your series of narrative hooks, where you plant the seeds of interest, curiosity, questions that need answers, the wish for a character to excel or be crushed, etc. Once you have that established, the trick is to give them payoffs along the way while simultaneously planting more hopes/wishes/questions in their brains for the story yet to unfold. Sufficient payoff for the amount of lead-up attached to the event or realization. If you’ve spent the whole book leading up to this moment, then this scene is your climax, and you need to make it count. If there’s been only a hint or two, this either needs to be an unexpected major turning point, or it needs to be okay that this scene is only a minor moment of satisfaction – a hint to your audience that you know what you’re doing and they can trust you to give them more. If you’ve built this up as something important, it needs to alter the story and/or the characters in some way. A big action sequence that leaves the characters and the story right where they were before the action is a waste of words and a waste of time. A payoff scene should raise the stakes, change someone’s mind about something, reveal a new side of someone, alter the dynamics between two or more characters, move the plot or at least a subplot forward and/or link a subplot to the main storyline, and/or answer at least one question raised in the earlier part of the story. Your protagonist must suffer to achieve his/her satisfaction. There is no growth without pain, and there is no story without growth. Readers want to root for someone who’s having a hard time and toughing through it the best they can. The reader’s sense of satisfaction in the high points of your protagonist’s journey are only as strong as the severity of what the protagonist faces at the low points, and how well he or she bears that suffering. Until you’re approaching your wrap-up, continue to raise questions, doubts, internal waverings, and so on as you write scenes to answer for the previous questions and doubts and so on. Every choice closes one door and opens three more, as you head toward the climax. The immediate lead-in to your climax is where that changes, where choices narrow and everything suddenly hinges on THE HERE AND NOW for your characters. Give a moment, even just a line or two, of reflection after a big change, heavy action, heated dialogue, etc. Make sure you give voice to the aftermath, the undertones of your characters’ feelings, etc. After an argument with someone you’re close to, you may be angry, but there are raw vulnerabilities rattling around in your head that you normally ignore. There’s emotional exhaustion. There might be unexpected tenderness toward the person you’re at odds with. There may be a battle in your head about whether to push the person away or whether to pull close to them again. Bring this stuff out in your characters in these “aftermath” moments, and your pacing will be the better for it – your story will be deeper for it, too, and your characters more accessible and more “real” to the reader.